Top Chef: The Cruise sails from The Port of Miami Cruise Terminal Miami, Florida. The cost of transportation to Miami is not included in the price. Travel Time 8 miles from the Miami International Airport; travel time is approximately 25 minutes. 25 miles from the Fort Lauderdale International Airport; travel time is approximately 45 minutes. Follow the signs to Biscayne Boulevard (Exit #2A/#2B). Follow directions for Biscayne Boulevard South; turn right at traffic light/stop sign. 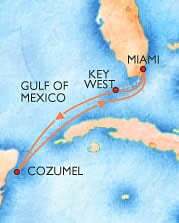 The entrance to the Port of Miami is at Biscayne Boulevard and Port Boulevard (N.E. 5th Street). At the traffic light, turn left at Port Boulevard (N.E. 5th Street) and proceed over the bridge. Turn left at the traffic light (South America Way). Stay in the right lane and follow the signs to Terminal C and B.